Comment: As long as the planet Earth has existed, for billions of years, eleven mass extinctions have taken place. The largest extinction took place between the Permian to Triassic periods 250 million years ago when about 90% of animal and plant species were annihilated. Today in Russia they want to collect all living organisms and preserve them by building a unique database, a “Noah’s ark” of the 21st century. Answer: For the planet Earth and the world overall there is an end because “matter” is a certain feeling within our senses. Events of the world, our existence in it, time, the sequence of actions, and everything that happens, occurs only in our senses. What lies outside our emotions, we do not know. We do not know whether something really exists or not. We have spent our thousands of years of existence building cities, archives, libraries, theaters, and everything else, but in fact we are like children building in sand. Nothing exists except our feelings, our emotions. Soon our feelings will begin to change drastically. Soon we will begin to feel the world from a new attribute, the attribute of bestowal, and then the present attribute of reception will seem as nonexistent. We will rise above the attribute of reception and everything between us in this world will simply fade like smoke. The world will disappear because humanity will feel a new feeling, a new coordinated system. Question: So nuclear wars will not be the reason for the disappearance of the world? Answer: No, in any case nuclear wars won’t destroy the whole of humanity because humanity needs to reach a new state where it will change and correct itself and rise to the next level of development. Even if nuclear wars would destroy 90 % of humanity, then the remaining 10% will be committed to carrying out the complete plan of creation. And when the plan of creation is carried out, the way we feel about the world today will disappear and we will begin to feel ourselves and the world surrounding us in a completely different way, in the form of a single complete soul. Question: Won’t you be sorry that the seventy books that you wrote will just disappear? Answer: I am willing for them to disappear even tomorrow; the most important thing is that humanity will begin to move forward. I know that my work for the advancement of the world won’t disappear. It will be recorded and exist thanks to the spiritual accomplishments that people can make on their own. “The same is true for the United States, Canada, Australia and the UK. In the United States, tens of millions of US citizens quietly resigned themselves to the absence of any interest income on their savings for seven years. Instead of asking questions and protesting, the Americans mindlessly agree with the propaganda that their existence depends on the success of a handful of artificially created mega-banks that are ‘too big to fail.’ Millions of Americans are convinced that is better for them to melt their savings than for corrupt banks to collapse. My Comment: The nature of the world, egosim, is not limited, to the point that it would lead to the destruction of the world and ultimately die itself. It is just like a cancerous tumor kills the body in which it is found and at the expense of which it lives, and ultimately dies itself, because beside the ego, there is no other force in our world. Only the attraction of the characteristic of bestowal and love in opposition to the ego is able to balance the ego and create an equilibrium in which it is possible to exist in perfection and eternity. Methods of correction (additions) to the self-interest of the world achieves a harmonious system called Kabbalah. Question: What does it take to start studying the wisdom of Kabbalah? Are there any limitations? Answer: We don’t put anyone under a polygraph test, but a person who wants to study the wisdom of Kabbalah should be mentally healthy. The reason is that this study requires a certain level of internal concentration. It is a study of the meaning of life, of man, of our connection with nature, and of the way we are all connected to each other, etc. The wisdom of Kabbalah deals with information that can require a bit of an effort from a person. I have come across cases when the condition of a mentally ill person who didn’t have strong nerves worsened as a result. These cases are quite rare, but it may still occur. Question: Can a person study the wisdom of Kabbalah by himself or does it have to be in the right framework? Answer: He will not achieve anything if he studies by himself. 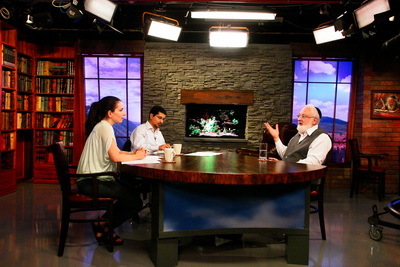 The point is that studying the wisdom of Kabbalah is divided into theoretical and practical study. A person has to gradually feel the plan in which the Kabbalistic instructions operate and how he should work with them, change himself and his fate, and this is only possible in the circle of his friends. Question: Does that mean that the wisdom of Kabbalah is a collective study? Answer: Yes, according to the wisdom of Kabbalah, all of humanity is in a collective, living in an absolutely enclosed space. Question: The first human head transplant is about to take place in 2017. How will a person feel after such an operation? Answer: Similar questions were raised when the first heart transplant was planned, and what has changed? What is so special here? A head is simply the control unit that manages the body by sending signals so that the body will operate properly, nothing more than that. The body will continue to function as long as the head is precisely connected to the body. I don’t see anything supernatural in it. How many heart transplants take place today? When such an operation took place for the first time in South Africa, it seemed to be a revolution, but no, they simply placed a new pump to make the blood flow. It is the same with the head. The head is not an organ that records information. The recording of all the information is in the space that surrounds us and the head is only a modem that connects the body with the space that surrounds us in order to operate the body according to the orders that it receives from there. All the laws, the records, the information, everything, are stored in the space around us. Our brain perceives this information, processes it, and conveys the orders to the body and thus operates it so that it can perform certain actions besides the general functioning of the body and that’s all. Thus the brain, like the mind, basically carries out all our egoistic desires. The brain serves the desire. Question: What motivation can I have to attain the upper force through the wisdom of Kabbalah and the connection with others if everything is erased from our memory after we die? Answer: Nothing is erased or lost. A person doesn’t remember his previous lives because he has never left his body, which means that he has not yet reached any spiritual attainments and therefore doesn’t feel anything beyond his body. But nonetheless, all of a person’s lives will return to him in any case. It doesn’t mean that he will reveal them, but all the past experiences will be revealed and cleared up to him, and by that a person will be able to reach the upper world. How should we relate with the growing incidence of expressions of hatred in Israel? What makes us a nation and why will only educating people to love others as themselves help us live in peace with one another? It isn’t clear what all the commotion is about, after all hatred has been part of every aspect of our daily life in every sector of society. We are the worst because we have to set an example of love of others and we don’t do so. If we don’t keep the basic rule of our nation of “love thy friend as thyself,” we are not considered Jews or the nation of Israel. We are in complete darkness today and we need to reset ourselves and redefine what it means to be Jewish. We are in great trouble: there is no nation or State of Israel since there is no connection between us. We are advancing toward a point in which we will literally devour one another, as the prophets say. The whole Torah is only about “love thy friend as thyself,” period. This is also what the wisdom of Kabbalah tells us. We need to start a general social educational process teaching love of others and set it as an example to the world: in schools, universities, workplaces, the media, for pensioners, for the unemployed, for families, for everyone. We should reach appoint in which the state doesn’t give anyone anything unless he studies what “love thy friend as thyself” means. It is not the time for speaking nicely now, it is time to act! We should engage in what happens today so that it will not happen again tomorrow.